Tuck Everlasting: I had always thought that a film whose crowning glory is its beautiful narration must have been a really good book. Tuck Everlasting by Natalie Babbitt has been on my to-read list for a long time, ever since happy afternoons spent watching the feel-good movie. (I will never get over how pretty Alexis Bledel looks in the movie.) 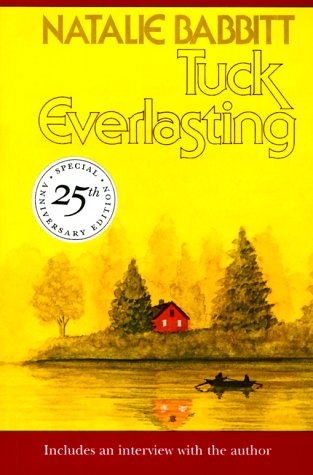 Tuck Everlasting is a strange tale about immortality and its consequences. The Foster House is a towering structure that lies at the edge of a forest, and the beginnings of a small village. The only important family in the village, the Fosters own the forest. It's a mysterious wood that people would rather stay away from, anyway. The Fosters are a very proper family, and Winifred Foster is a lonely child. A ten-year-old who is not even allowed to play in peace in her own front yard, Winnie decides one day to run away from home. In the forest, Winnie meets a handsome young boy. He's sitting beside a spring drinking water, when she comes across him. Thirsty herself, Winnie tries to drink from the spring. But he forbids her. His mother arrives after him, and before she knows it, Winnie finds herself kidnapped by the strangest family - who call themselves the Tucks. The Tucks tell Winnie a story - about a spring that gives eternal life to the drinker and a curse that entraps those who drink from it. The Tucks claim to be over a hundred years old. And now that Winifred knows their secret, they refuse to let her go. And as strange as this story is, here's the oddest part of the affair - it is with the Tucks that Winnie feels the most comforted, and she has no wish to return home. But the Tucks don't know that they are being followed and Winnie has no clue what life has in store for her if she's found. Like the movie, it is a feel-good story, quite easy to devour in a single sitting. It is a neatly wrapped story, with a tidy bow atop. Thing resolve marvellously at the end, so much so that you almost wonder, was there any conflict at all? On Children's Book Choices - Children these days have a much more vibrant choice of books to read than I did. Now I don't know if this is city-, country- or simply individual-specific; but I have a feeling there did not use to be quite as many books about rat-burgers or underpants back in the day. When I recommend books to children, I try to find a balance between the whimsy and the "life lesson" for lack of a better word. Recommendations that have worked wonders so far include Lemony Snicket, Diana Wynne Jones, Neil Gaiman, J. K. Rowling (need I even say?) And as a teacher, trying to justify my choices, I think that what ties these together that each of these books, though child-like and playful and fun, introduce a new string of thought to the reader's mind - have a deeper theme, a message, an idea, a perspective. And Tuck Everlasting does that beautifully. The other day, I was discussing with a few of my classes whether it makes sense to them that books like Harry Potter are banned in certain schools either because they promote witchcraft (which, not being Christians ourselves, we can be coolly objective about) or because they have themes a bit too adult for a young age. The responses were varied - one child said there was no need to expose children to things beyond their understanding as misunderstanding are worse than naivete. Another was convinced that anything that will be discovered eventually, may be discovered from a safe source right now. The conversation - stemming from our read of Harry Potter and the Philosopher's Stone - took a turn to the topic of death, and consequently, immortality. When did my dear children first become aware of the concept of death? I made it a point not to come out and say this in so many words, of course, because there are still some faces in the class with that touch of rare innocence that can be so easily lost. And yet, it was a discussion worth the effort, for it brought out precious perspectives... is there a right age to find out about death? Would you tell your kid sister about it? Can you imagine what Dumbledore meant when he said... "To a well-organized mind, death is but the next great adventure."? February Reads: I did not read the planned four books, but have still somehow had an eventful two months of the new year. Apart from Americanah, which I reviewed, I have read Tuck Everlasting, Feet of Clay by Terry Pratchett, A Bad Beginning by Lemony Snicket and came across and fell in love with The Velveteen Rabbit by Margery Williams. Currently immersed in two books - Eating Animals by Jonathan Safran Foer and Dandelion Wine by Ray Bradbury. Many reviews coming up, soon I hope.